The holy grail of getting into orbit has always been the ultimate development of space elevators, long, thin strands that could ferry passengers and cargo into orbit at minimal expenditure. 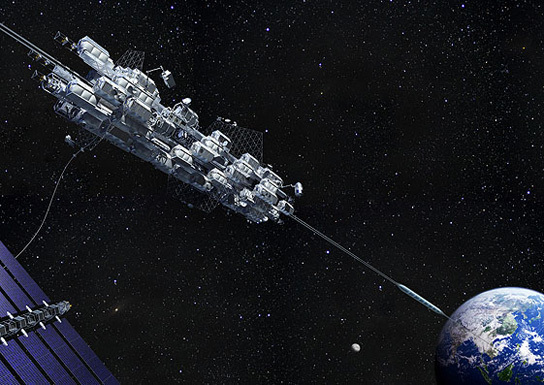 Now a Japanese company, Obayashi Corp, specializing in engineering and construction, announced that it aims to complete a space elevator by 2050. Obayashi Corp is building the Tokyo Sky Tree, an observation tower under construction in Sumida, Tokyo, Japan, and has been the tallest artificial structure in Japan since 2010, and their plan calls for a 96,000 kilometers of carbon nanotube cables extending from an anchor point planted deep in the sea, into space, where it would be secured by a spaceport, which also serves as a counterweight. There would also be a terminal station midway, at 36,000 km, which would house laboratories and accommodations since the trip to orbit could take about 7.5 days. 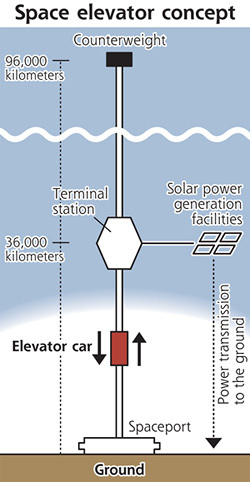 The JSEA (Japan Space Elevator Association) estimates that building such an elevator would cost ¥1 trillion ($12.5 billion), which isn’t bad considering how much is invested into defense in the US. The elevator will allow 30 passengers at a time to travel upwards at 200 kph (125 mph). It makes sense to use carbon nanotubes, but skeptics aren’t convinced that this will actually be feasible. All in all, at least the goal is ambitious. 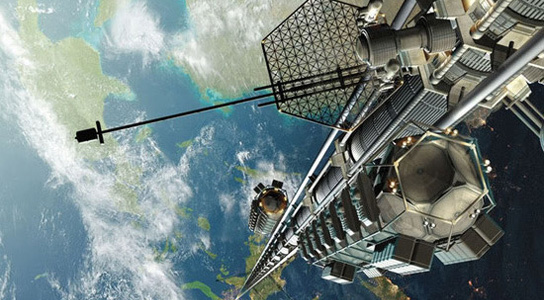 1 Comment on "Obayashi’s Space Elevator to Be Operational by 2050"
Now all I have to do is live long enough! Man, I’ve waited for this ever since I started reading Arthur C. Clarke.